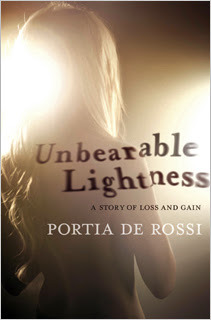 Yesterday I bought Portia de Rossi’s memoir on her prolonged and life-threatening battle with disordered eating, Unbearable Lightness: A Story of Loss and Gain. To be able to sit down and read, to completely consume, a book in one sitting is my idea of Living the Dream. I often work on many books at once, in fragmented piecemeal, but my preferred method is to sit down and make reading an event, not just a pass time. Reading marathons have become an obsession. The word obsession is troublesome, or rather, obsessions themselves are. But the word is too, as all words are when we don’t think about how we’re using them and the message we are conveying. I used to use it freely and gratuitously. I linked Obsession to those other things I loved and cultivated, Passion, Drive, Determination, Work Ethic. And so I was obsessed with everything. Whether it was “I’m obsessed with soccer” or “I’m obsessed with the Backstreet Boys,” my mom didn’t like it. She didn’t like my use of that word. She thought obsession, in any form, had the potential to be negative. And probably would be. I thought obsession could be positive and, in some ways, I still do. How can there be anything wrong with being obsessed with fighting injustice? Obsessed with doing good for others? Or harmless and irrelevant obsessions, like being obsessed with eating clementines (a shout-out to my friend) or obsessed with Seinfeld (a shout-out to myself). But a real, true obsession is rarely harmless or irrelevant. And seemingly positive, self-improving obsessions are usually harmful, because to be obsessed with ANYTHING, including eating healthfully, or exercising, has so much potential to take over your life. We use the word so freely and unconsciously, but think about what it mans to obsess over something or someone. The problem with obsessions is that it is difficult to have more than one. If you truly have a deeply rooted, insurmountable obsession, and your thoughts are dominated by persistent and unrelenting ideas and desires, it’s hard to do much else. A lot of time and energy goes into nurturing an obsession. If an obsession, even a superficially positive one, overtakes other fundamental aspects of your life, then you can’t write it off as just being “passionate” any more. At least I couldn’t. Now, back to the book. I picked up Unbearable Lightness for a few reasons, not least of all that it was on sale for $9.99 at Coles plus my irewards discount. First, I like Portia de Rossi. Until I watched and (temporarily) became mildly obsessed with Arrested Development – desiring to watch the next episode and constantly laughing while recalling things that happened on it DID dominate a portion of my thoughts for a couple of weeks – I liked Portia because Ellen liked her. I love Ellen, and if she loves Portia, than Portia is fine by me. Now, as a fan of Arrested Development, I like her as an actress. After reading her book, I like her as a talented autobiographical writer and an icon for hope in overcoming a myriad of horrible illnesses and obsessions. Secondly, I love memoirs. Especially the brutally honest and painful (to read, but even more so, presumably painful to write) kind. Whether it be the ambiguously autobiographical kind, in which the book is not classified as non-fiction / autobiography, but it’s openly well-known that the writer is portraying aspects of her own life, like Jeannette Winterson’s Oranges Are Not the Only Fruit or Plath’s The Bell Jar, or the in your face, this-is-my-horrible-but-inspiring-story kind like Elizabeth Wurtzel’s Prozac Nation (to name a few of my favourites), I love to read them. I like to see how people represent themselves and express their stories, and especially, how they manage to convey the darkest, most crippling and bleak times of their lives. I knew de Rossi had struggled with anorexia and bulimia, alternately and intermittently, and I knew she survived. So I wanted to read how. De Rossi’s book is pretty incredible. Her honesty is astounding and the complexities and pain of her journey are palpable. From throwing up in a plastic bag after bingeing, to fearing sitting still for too long because of her morbid, obsessive fantasies about the fat cells forming in her body, to avoiding lip gloss because of the inadvertent calories within, de Rossi conveys the dark, twisted, life-consuming and soul-destroying world of weight obsession, something intimately tied to her homosexuality, which she kept secret for many years, resulting in a confusing loss of identity and fear of scrutiny. Some people think that these disorders aren’t illnesses, in the medical sense. It’s so hard to understand diseases that originate in the mind but become so traumatizingly physical, through starving the body, compulsively exercising, abusing laxatives, inducing vomiting, and compulsively overeating. No one chooses to be anorexic, any more than someone chooses to have cancer. But, of course, many illnesses are the culmination of choices, voluntary and inadvertent, along the way. It’s easy to think “Can’t they see what they’re doing to their body?” “Don’t they see how thin they are?” “Why don’t they stop?” “Have they lost their mind?” In a way, yes. De Rossi’s book shows that the anorexic mind is unable to see meaning or purpose in anything, except losing weight. Fat and food become enemies, measuring every interaction of calories in and calories out, an obsession. The disordered eating body has ceased to reasonably understand and cope with its own natural and necessary relationship with nourishment. To eat is to fail, to be weak, to be imperfect. Some people think of anorexia as a vain disease. But regardless of the societal ideals of thin bodies that spur the obsession, it goes way beyond appearance and beauty. It’s about control, and losing it in a desperate and deranged attempt to obtain it. It’s hard to imagine the extreme loneliness that accompanies this kind of disorder, especially for someone in the public eye who lives in terror of being found out. Photo shoots, magazine covers, and roles on a hot television show sound like the stuff of happiness, but are hard to enjoy when the debilitating fears of gaining weight, having your habits discovered, and living up to your own impossible and unhealthy goals permeate your every waking (and sleeping) moment. I found Unbearable Lightness so compelling because it showed me the anti-glamour and loneliness of living and working in a looks-obsessed industry like never before. De Rossi writes from an extremely vulnerable and damaged perspective, exposing the shame, paranoia, obsessive habits, emotional instability, and life-threatening physical decline that marked her journey from a normal, healthy weight, to a wasted 82 lbs., to the other end of the spectrum, to 168 lbs., over the course of her suffering and, and eventual, healing. I imagine that it’s very hard to re-think and re-live such events and more so to write about them. Unbearable Lightness is the best survivor story of eating disorder that I’ve yet to read. Another reason why I wanted to read this book: while I don’t consider myself ever having been anorexic, I certainly suffered from disordered eating and body dysmorphia in my teens. Around age 15 it was most visible. I remember the growing obsession with my appearance, with maintaining discipline in every single aspect of my life, and most of all, with perfectionism. Perfectionism is another misunderstood disorder that, while not medical in the same sense as anorexia, is bound up in so many psychological illnesses. The perfectionist doesn’t think he or she is perfect, or close to it, or capable of attaining it. Not at all. The perfectionist thinks he or she is imperfect, flawed, inadequate, and will always be that way, yet has an overwhelming drive – obsession – with being better, more put together, more in control. Failure, rejection, and disapproval are the perfectionist’s biggest fears. I remember exercising as soon as I got home after school and trying to “fast” whenever I could manage it. So much of being a teen - a post-puberty, hormone-riddled, uncomfortable, confused, anxious, and angsty teen - involves feeling a complete lack of agency and control. Moderating what you eat, when, and how you can transform your body into something other than what it was, feels empowering. My weight loss obsession was brief because I didn’t have much weight I could part with. As a strong, athletic, metabolically-blessed 14-year-old, I was around 110 or 115 lbs. when I started obsessing. I decided that I was too big, and intentionally started working on my weight loss. 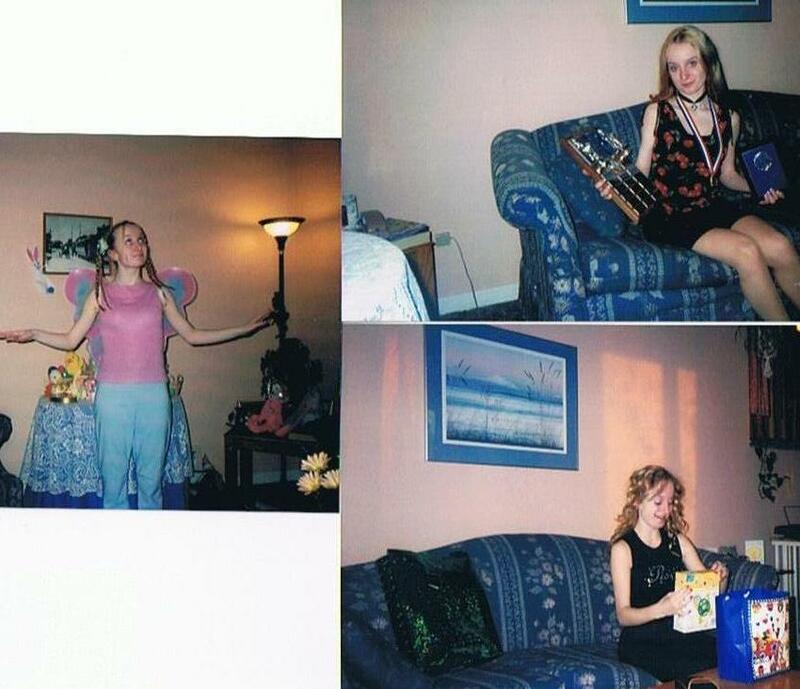 I got down to 95 lbs., which, while not too scary or skeletal looking on my petite frame, was not the natural weight for my body at that post-puberty age. With the intervention of friends, counselling, and going to cadet camp for a rigorous three weeks where I realized I had to eat a lot, and routinely, or I wouldn’t be able to survive it, I stopped this pattern. I got off easy. I woke up and got out of a cycle of self-deprivation and self-loathing that could have worsened extremely. I don’t think I’m at risk of becoming so messed up in my self-image again. But now, 10 years later and still struggling with attaining the weight I want, I am more inclined to over- than under-eat, so subconsciously scared, as I know I am, of becoming obsessed with my weight. I have so much empathy and admiration for anyone who finds themselves in the darkest pit of self-loathing and mind-altering obsession and manages to claw their way back out. De Rossi’s memoir is truly inspirational, and should be read by anyone, regardless of their personal connection or understanding of eating disorders. In retelling her story and providing insight into the mysterious and awful compulsions of disordered eating, it becomes clear how self-defeating such an obsession is to one’s happiness and overall experience of life. We can spend a lot of time wanting things to be different, and hating ourselves for failing to make them so, when we could be making the most of the short time we're given.